Ocean Breeze Cottage on Bailey Island is now available for your seaside vacation, no matter the season. This well-insulated cottage, heated by geothermal system, is appealing during the less - crowded brisk Maine springs, the lazy ocean-breezed days of summer, the colorful crisp days of fall, or the quiet peaceful days of winter. Ocean Breeze cottage is on the east side of the island with an unhindered view of Casco Bay and spectacular sunrises, and just steps away from a secluded beach at the end of Oceanside Road in a quiet neighborhood. Yet, the cottage is walking distance of the Bailey Island General store, the post office, a non-denominational church, several local eateries including the famous Cook's Lobster House, and Mackerel Cove; the hub of the fishing and boating community, Entertaining and socializing has a comfortable flow in this 2 bedroom-1 bathroom home - perfect for family get-togethers, reunions, special events or simply a nest to enjoy the Maine experience. For larger groups we also rent Friendly Cottage on the same property. (# 962008). The nearest shopping centers are in Brunswick (13 miles away and a 30 minute drive) .Stopping at a grocery store before you come to Bailey Island might be more convenient, although there is a general store with limited supplies. Experience living in a newly constructed energy efficient home. Ocean Breeze Cottage is entirely on the second floor with its own private entrance and stairway. There are unobstructed views of the ocean from the private corner deck facing east and south. The lower level of the building is used primarily for storage and has its own entrance. Check out our other rental Friendly Cottage HomeAway # 962008 next door. The village of Bailey Island consist of a general store, post office and non-denominational church. The public beach, at the head of Mackerel Cove has room for parking and is good for swimming, boating and collecting shells. It is about a 1/2 mile from the cottage. The favorite beach , Cedar Beach, is a short walk from the cottage down Cedar Beach road. There is little space for parking so if you are able, walking from the cottage is the best option. The view from the red chairs on the point look southeast over Casco Bay. In front of the cottage there is a small beach and when the tide is out, lots of tide pools to explore and ledges for surf-cast fishing. We had a great stay at the cottage. It was clean, cozy, comfortable and quiet. 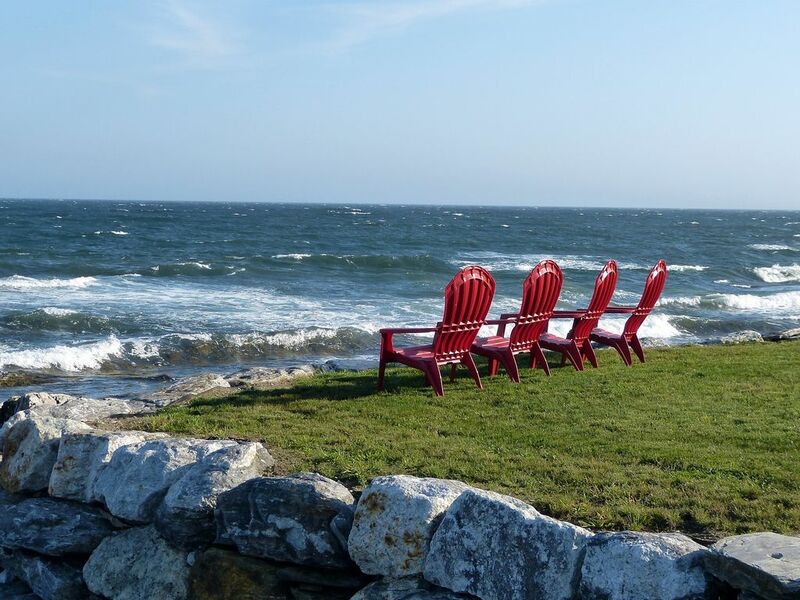 The most beautiful beach is a 10 minute walk away and the red chairs in front of the cottage were great for relaxing and watching the surf and birds. Bailey Island is a gem. Hope to be back next fall. We agree - Bailey Island is a gem! Thank you so much for the very positive review and for leaving the cottage in such good condition. We hope to see you again next fall! We stayed for a week and the cottage was great! Hearing and seeing the ocean right out front was fantastic. Bailey Island is not far from Brunswick and Freeport and has many great hiking trails within a short drive. Very peaceful location and a beautiful place to stay. Highly recommend this very comfortable, nicely decorated and spotless cottage for a relaxing vacation! Thank you for your very complimentary review. Thank you also for leaving the cottage in such good shape. We're so glad your vacation created great memories. Please come and stay any time. Very nice cottage, nice, attentive owner who is very responsive to even minor issues. The house sits back about 50 yards from the water and allows for a pleasant walk down to the chairs. I loved sitting there, especially at high tide. This property is one of the nicest we saw on the whole peninsula. Two good restaurants only a few minutes away by car. Would recommend the place. Thank you for your very positive review. You came at a nice time of year - a little quieter with crisp fall air. We're glad that you had an enjoyable stay and hope you come back again sometime. We loved our stay at Ocean Breeze. The cottage was clean, light and airy and the views wonderful. The furnishings were comfortable and the owners provided for all needs. The lack of a dishwasher wasn't a problem for us. The bathroom off of the master bedroom wasn't ideal when we had overnight guests, but we managed it and was not a major issue. We didn't mind being a little flexible on that point, because the positives of this cottage far outweighed that inconvenience. The deck off the living room was heavenly and we spent several hours enjoying the sights and sounds from their, reading or just relaxing enjoying a glass of wine. The chairs at the edge of the beach were a great spot as well. The owner Eric, was accessible and very accommodating and easy to work with. He included instructions and suggestions for exploring the Island. We enjoyed the walk to Cedar Beach and exploring the Giant Steps. All in all it was a wonderfully relaxing stay. We're so glad that your stay was relaxing and enjoyable. Bailey Island can be a great place to charge your battery. Thank you for the glowing review and for leaving the cottage in such a good condition. Please come again any time. Our family of 3 enjoyed this rental with an outstanding view of the water. Bathroom adjacent to Master BR was not an issue for us. Everything as pictured and very clean. Owners very responsive to inquiries. Plenty of privacy, despite being near other homes. Appreciated the fans very much, since Maine was having warm weather. Sat out on the water for hours, a perfect place to just have a cocktail, read and relax, in those red chairs. We enjoyed the 10 minute walk down to the neighborhood beach, which is fairly wide at low tide. Bailey Island has beautiful views and is unspoiled. The Giant Stairs is a short easy hike with outstanding water views; the turn for it is Washington Ave, there is no on-road signage. Highly recommend the Dolphin and Morse's for delicious meals and more great water views. This rental is located on a gem of waterfront property, thank you Eric for making it available to enjoy! We're so glad you had a wonderful stay on Bailey Island and got to enjoy some of it's treasures. Thank you so much for your positive and informative review. Also thank you for leaving the cottage in such a nice condition. Come back anytime. An immaculate and lovely house on the beach. We enjoyed our stay so much--thank you Laurie and Eric for being such wonderful hosts. Close to Mackerel Cove, Cedar Beach, Giants Stairs and other attractions. We also loved just eating and relaxing on the deck overlooking the water. A perfect Maine getaway for me, my husband and our 4 year old. Would definitely stay again. Thanks for the lovely review. It was a pleasure having all 3 of you with us. Please come again any time! Bailey Island is almost 3 miles long and less than one mile wide. It is found 20 minutes from the town of Brunswick, Bowdoin College and the home of the famous Maine State Theater; 30 minutes from Freeport and L.L. Bean and 45 minutes from Portland and the Jetport, The coastal towns of Bath, Wiscasset, Boothbay Harbor, Camden, Rockland and Rockport are must sees within a 2 hour drive on Route 1. From Orr's Island, you will cross the famous Cribstone Bridge to Bailey Island - a prelude to the special place you have chosen to vacation. Enjoy all the Islands have to offer - several beaches including sandy Cedar Beach, hiking - don't miss the ‘Giant Stairs', buy lobster fresh off the boats in Mackerel cove, rent a kayak to explore the area from the water - including Eagle Island, to tour Admiral Robert E. Peary's summer home, now owned by the state and open to the public as a historic site. Bailey Island is in the town of Harpswell along with Orr’s Island, Great Island and Harpswell Neck. For more detailed information on restaurants, Boating and Marine services, Hiking trails, shopping, lobster pounds, and other activities our town has to offer go to Harpswellmaine.org. Although there is a general store on the island, we recommend you stock up on groceries in Brunswick before coming to the island since it is about a 30 minute ride from here. There are many places to buy live lobsters right off the boat on Bailey's. You can buy lobster and clams and have them cooked for you to bring home at the dock at Morses.